Employees and individuals who work with their hands and wrists in repetitive movements on a daily basis oftentimes suffer from the early stages of carpal tunnel syndrome. Numbness, pain, tingling and weakness in the hand and fingers are early signs and it’s important to keep an eye on the area to prevent further damage. If you’re currently suffering from or looking to prevent carpal tunnel syndrome, our trained experts recommend the DonJoy ComfortFORM Wrist Support to stabilize strain. The contoured design of the brace fits the natural contours of the wrist and hands to provide the best in fit and support, allowing you to type, move and work just as you normally would. The adjustable straps and lightweight material also adds comfort while wearing the brace so you feel completely supported. Some braces on the market might make you feel like your wrist isn’t fully guarded, but the ConfortFORM incorporates aluminum palmer stays to control how much or little your wrist moves leaving you fully protected. From ease of use, fully adjustable straps, durability and proper fit, the DonJoy ConfortFORM is a great solution for those looking to protect or heal themselves from carpal tunnel syndrome. Do you spend weekends pushing your body to the extreme and regretting it? If you limp into the office on Monday morning with yet another injury or ache, pushing yourself might be causing you more harm than good. We all know an active lifestyle is important, but too much activity for your fitness level can put you on the sidelines. If you’re playing hard, protect yourself with good shoes, wrist guards and proper equipment. Wearing an ankle support or knee brace can help you prevent injuries. Use good technique to keep injuries such as tendinitis and stress fractures at bay. Increase activity slowly and strive for workouts that include strength training, cardiovascular and flexibility. Warm up to help muscles contract and relax easily. Spend five to ten minutes briskly walking or jogging before the workout begins. If you’re an athlete, try out the Pre-Warm Up Program on the Compex Performance Muscle Stimulator. Stretch after the warm up to increase blood flow, flexibility and performance. Practice proper technique when stretching and use caution, as stretching strained muscles may cause further damage. Hold for 30-60 seconds. To further avoid soreness, consider the Active Recovery Program on the Compex Performance Muscle Stimulator. Keep in mind your body probably cannot perform to same level as when you were young. Rather than packing all your workouts into weekends, hit the gym on weekdays too. Prone to injury? The most vulnerable areas are the knees, lower back, shoulders, wrists, and ankles. Typical weekender injuries include sprains and strains, muscle aches, knee and back pain, heel pain, rotator cuff injuries and shin splints. Braces and support are not just for injuries; they can help prevent injury too. Talk to your health provider if you have specific concerns. Do they make wrist braces for weight lifting? Weightlifting wrist braces, also known as weightlifting wrist wraps, definitely do exist! 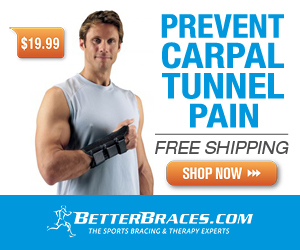 In fact, we offer a couple of them here on BetterBraces.com. If you’re ever wondering if we have a brace for a certain activity that you do, call one of our brace coaches at 1-800-553-6019. They’ll help you select the right brace for your needs. Not only do our braces help athletes from the usual sports (football, basketball, etc. ), but we also have sports for out-of-the-box activities, such as motocross, rodeo, and surfing! P.S. We also have snowboarding wrist braces, too. We wish the poster of that question had seen this years ago! Summer is here in full force, and so are summer sports! Swimming, surfing, beach volleyball and more. Plus more people are taking to outdoor activities such as jogging, walking, rock climbing and rollerblading. It’s time to pull out the sun block… and don’t forget to protect your joints while you’re out playing. Like all activities, summer sports can cause injuries. Check out the following braces and supports so you can have fun in the sun and have peace of mind. Knee Braces – Running in the sand or out on a field can cause ligament injuries and knee strain. These knee supports will help protect your knees and give you added strength when you need it most. Ankle Braces – Your ankles support your body in everything you do (except maybe sunbathing)! It’s important to wear ankle braces to get extra stabilization when participating in summer sports. Wrist Braces – Running around always comes with a risk of falling. Most people brace their falls with their wrists, which can lead to wrist fractures and wrist sprains. Wearing wrist braces can help prevent these injuries and keep you healthy as you’re having fun in the sun. Enjoying the nice weather means that you don’t want to get sidelined when you’re out having fun. Check out these braces and supports and enjoy a healthy summer! One of the most common causes of wrist injuries is due to falling. Our natural reaction when falling is to brace the impact with our wrist. While this does reduce the force on the rest of the body, the brunt of the impact is taken on by our delicate wrist joint, leading to wrist sprains, fractures and even breaks. If you participate in activities where there is risk of falling, then it’s important to learn the correct techniques for falling safely to protect yourself from injury. You can do this by wearing wrist braces that help absorb the impact of the fall. They also help stabilize the wrist after an injury and minimizes unnatural movement on the joint. DonJoy CXT and SXT Wrist Brace – One of the strongest and most durable wrist braces on the market and perfect for heavy-duty sports. DonJoy ComfortFORM Wrist Support – Great for general wrist injuries and is designed for everyday use. Start protecting your wrists from fall injuries today!